Four panels of glass depicting figures held within a wooden framework. 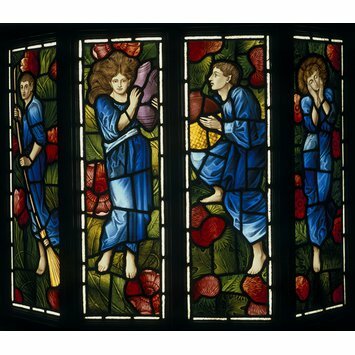 Each panel depicts a figure, human in appearance except for pointed ears. Each figure wears a flowing robe. The framework has an iron chain attached to the top and electric light fittings (ca. 1980 ?) inside. The two outer panels flank the two central panels at an angle of about 45 degrees. There is a curved 'roof' to the structure and flat wooden panels enclosing the lower half. Made for and removed from Soham House, Snailwell Road, Newmarket. Historical significance: The Brownies, in Mrs Ewing's book for children of that title, were good fairies who helped with housework. 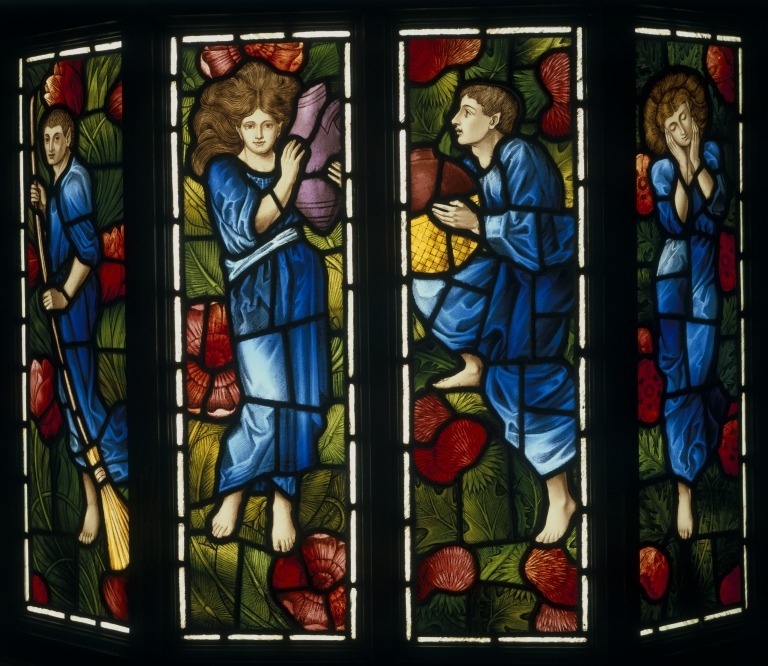 One of four panels from an oriel window, depicting fairies, entiltled 'Brownies'. Possibly from Soham House, Newmarket. Designed by Selwyn Image. English, c.1895. The Work of Mr Selwyn Image. The Studio. 1898. vol.XIV, no.63, pp.3-10.